Pain-Jigokudo or the Naraka Path controlled by Nagato. One of the most crucial among the Pain due to the ability to repair the damaged body using King of Hell. However, it can only repair one damaged body at a time. Other than that, the Naraka path can also use interrogation abilities using King of Hell. If the ones under interrogation lies they will meet death where the King of Hell consumes their tongue. Let’s take a look at Pain-Jigokudo abilities. Ninjutsu Transmigration: Resurrect a selected unit from your Lineup, the Life it is resurrected with will be based in Pain-Jigokudo’s Resistance. Ninjutsu Double Healing Jutsu: Heals 2 units with the least Life points, will also cancel 2 Debuffs of the targeted ninjas. Taijutsu Judgement of Hell King: Chases and Attacks a Low Floated unit, causes Knockdown, triggered twice each round. Ninjutsu Soul Absorption: Recovers 10 Chakra points and 10% of your Life every time a unit dies. Can be triggered 6 times each round. 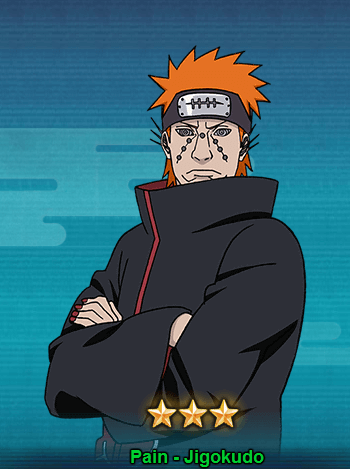 Ninjutsu Rinnegan – Defense: At the beginning of a battle, all Rinnegan attribute units in your field will have their Defense increased by 60%, lasts for 3 rounds. You can get Pain-Jigokudo from Tendo treasure like other Pain ninjas. You can also get him from group shop by spending 1500 points for 3 fragments of Pain-Jigokudo. As for the Tendo Treasure, you need to draw 40-60 seal scrolls to get Pain-Jigokudo.